Taxis are a big budget killer in Vietnam and a source of stress when you first walk out of the train or bus station. Despite reading advice about sticking to well known taxi companies, we found that the cheapest taxis were the smaller companies that weren’t allowed in the station but sat just outside the gates. They were also more open to negotiating a fee before you set off instead of just using their meters. The meter rates are posted on the window so have a look around before jumping into the first vulture’s car. Lonely Planet often tells you how many kilometres the bus stations are from the towns. Some quick math will tell you how much it should cost. If you work out a fee before you go, you’ll avoid getting ripped off by a taxi meter that’s rigged to run fast. The taxi dropped us off at Y Linh Hotel (320,000d/$15.20) where we checked into a nice room with a neck-crane view of the ocean. The bed was soft, there was a mini-fridge, internet, TV, everything we needed. But we didn’t hang around for long. We were off to find seafood, a Quy Nhon specialty. The view from our balcony at Y Linh Hotel. A fifteen minute walk along the beach took us to Dong Restaurant. Recommended in the Lonely Planet, it was seafood at its freshest. We ate a pile of shrimp fried in garlic butter, grilled scallops, deep-fried squid, and fried rice. The shrimp was candy from the sea. The scallops had been grilled in their shells and sprinkled with green onions, garlic, coriander, and peanuts. The deep-fried squid was so irresistible that we scarfed it down before we had a chance to take a photo of it. In total the meal costs us about $12 and left us stuffed to the gills. Just remember kids, don’t use the sealed napkins or eat anything they bring to your table unless you are willing to pay for it. Grilled scallops at Dong Seafood restaurant. 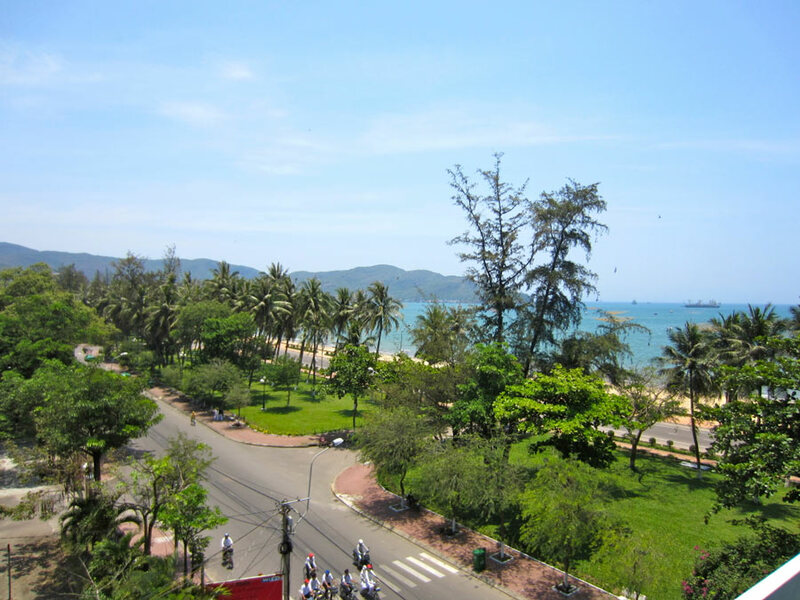 We enjoyed Quy Nhon — a beautiful beach, yummy food, a great hotel but, short on time, we had to move on so after one night we were off to Nha Trang. Most of the major bus companies skip right over Quy Nhon. If you are coming from Da Nang you’ll want to get the Mai Linh bus (160,000 – 6.5 hour trip leaving Da Nang at 8:10AM or 2:50PM), or the VATACO bus that leaves at 8AM, 8:10AM, 8:30, or 8:40AM. VATACO is cheaper, but probably not as nice. Going to Da Nang from QUy Nhon, you can catch a Mai Linh bus at 7AM or 1:5PM. If you want to be dropped off in Hoi An, Mai Linh will let you off in Vinh Dien where you’ll have to take a moto-taxi into town (about 50,000 VND), but there are also rumors of minibuses that go directly to Hoi An. Let me know if you have had any success with these. You’ll also find bus options to Nha Trang (4 hrs), Gia Lai (3 hrs), Kon Tum (4 hrs), Pleiku (3 hrs), Buon Ma Tuot (11 hrs), and even Vientiane, Laos via Pakse (12 hrs). The train station in Quy Nhon is only used for trains coming directly from Saigon. They are night trains that leave the city at 6:55PM and arrive in Quy Nhon around 8:30AM. For a soft sleeper it’s 572,000 VND per bed (there are 4 in a cabin), a hard sleeper (6 per cabin) is 427,000 VND, and a regular seat is 247,000 VND. Coming back to Saigon, the train leaves at 4:35PM and arrives in Saigon at around 7:15AM. Prices are more expensive on weekends. If you want to take the train north or south on the reunification line (the line that runs between Saigon and Hanoi), you have to make your way to Dieu Tri station (about 10 km out of town). The cheapest way to do that is to take the bus from the bus station to the main road just outside of the train station. You can also catch this bus going back from the station. Otherwise, a taxi will cost you about 150,000 VND. Trains to Trà Kiệu, which is the closest station to Hoi An, leave at ungodly hours. Therefore your best bet is to get a train to Da Nang and then head to Hoi An from there. Dieu Tri to Da Nang are available at 7:13AM, 8:46AM, and 5:30PM. The trip is about 5.5 hours. The costs vary, but head to the Vietnam Railways site to see the times, the costs, and to book if you have a credit card. If you want to head south to Nha Trang, a soft-seat with AC is about 139,000 VND. 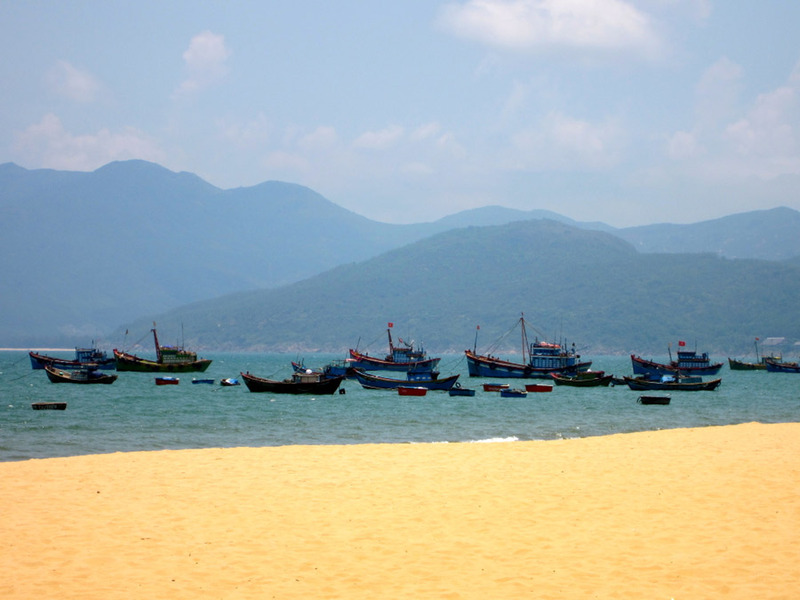 Quy Nhon, Vietnam is serviced by Phu Cat Airport. It’s about 35 km from Quy Nhon. There are only a few flights a day that arrive and depart from the airport. Vietnam Airlines runs them all and your only options are flights to Hanoi or Ho Chi Minh City. When you arrive at Phu Cat Airport, get your bags as fast as possible and then jump on the beige bus when you exit the building. It will take you to Quy Nhon for 50,000 VND — much cheaper than a taxi (about 400,000 VND). Quy Nhon has quite a few decent hotel options, but I like Hai Huong Hotel for it’s convenient location and reasonably priced double rooms. It’s very close to the bus station, the Big C supermarket, and just a 10 minute walk to the beach. If you want to save a couple bucks, you can get the economy room for about $10/night. It’s bathroom is private, but it requires you to leave your room. Otherwise, the private doubles are $12-15. Shrimp, and squid, and scallops, oh my! Quy Nhon has some great seafood restaurants that won’t break the bank (but will cost more than a typical meal). Dong’s is probably the most popular with tourists (because it’s in Lonely Planet). It offers great food eaten outdoors by the beach. 2000 Hai San (hai san means seafood) is also very good. It’s around the corner, but doesn’t have sea views. The upstairs is large and might be a bit lonely, depending when you go, but the food might be better here… it’s tough to say. At 232 Tran Hung Dao there’s a much loved eatery that specializes in bun thit nuong (only 20,000 VND), but also serves up typical com tam meals like com tam suon (rice and pork chops). For an extra yum, get it with an egg on top (com suon trung). For something a bit off-the-wall, you can try Face Restaurant, a student hangout that specializes in meats on a stick and fried stuff. I’m not saying the food will blow you away or anything, but it’s cheap and the atmosphere is usually pretty fun. Also, it’s conveniently located at 29 Nguyễn Nhạc. You might find that it’s easier to go to Da Nang then make your way to Hoi An, but to save money and time Mai Linh has buses that stop in Vinh Dien while on their way to Da Nang. From Vinh Dien you can get a xe om into Hoi An for around 50,000 VND (negotiate hard). The Mai Linh buses leave Quy Nhon at 7:00AM or 3:15PM and cost 160,000 VND (to Da Nang — it could be cheaper to go to Vinh Dien). It takes about 6 hours. Previous Tourist Limbo: Caught Between Hoi An and Da Nang, Vietnam Next Nha Trang, Vietnam: Sun, Sea, Sand, and Scams.